- Spelling, Grammar, and English use in general. It was a week before Halloween when Josh Stein came up with the idea. He and his best friend Ethan Raine would dress up in Halloween costumes from the same game series. Josh wanted to be Tails and Ethan to be Sonic. Because they both suffered from Dwarfism, they could represent those characters accurately. Ethan however wasn't enough of a fan of Sonic to jump at the idea and wanted something else. Therefore they made a bet that whoever could win two out of three of their favorite games would decide the costumes. Ethan defeated Josh in Warcraft III, but Josh won Super Smash Bros Brawl and Mario Kart so he chose Sonic and Tails for Ethan and himself respectively. The next step was getting the costumes. Fortunately Josh found a website called Rayne's that promised "Costumes so real you'll have trouble not being in character". Not only that, the site had a just before Halloween discount and free two day shipping. Josh submitted his and Ethan's measurements and ordered the costumes. They came the day before Halloween. The costumes seemed like nothing special but for the price they had paid, they didn't have to be. The night before Halloween Ethan was sleeping over at Josh's house. They both laid their costumes out on their beds since they'd decided to wear them to school. Such a thing was not unheard of on Halloween after all. Little did they realize that they'd be getting more than they bargained for, a lot more. Josh found himself in Tails' workshop. He recognized it by one of the various planes Tails had designed being parked in front of him and there was also a computer mainframe with Tails's insignia painted on it off to one side. The last thing he remembered was going to bed so he said "This is a nice dream, I'm in Tails' workshop. ", though no one else seemed to be around to hear him. "There you are" a voice that sounded like Tails' said from behind him. Josh turned and saw none other than the two-tailed genius himself walking down a flight of stairs. "Hi Tails" Josh said eagerly. "Hi Josh" Tails replied, then he added, "I have wonderful news, tomorrow you're going to be me for a day!" Tails seemed very excited about it so Josh caught his mood and replied, "Cool, I've always wanted to be you. Flying must be awesome." Tails replied, "It is, but you'll learn that first hand soon. After tomorrow, you can be me or you as you choose, but tomorrow you'll be stuck being me, not that I think you'll mind much." Suddenly the computer started making an alarm noise that Josh thought sounded like his alarm clock and the screen said, "Alarm: Wake up!" in flashing red letters. Josh vaguely heard Tails say "Have fun!" before everything faded into the sound of his alarm clock blaring. Josh woke slowly and without getting out of bed fumbled with the switch for his alarm clock. After he'd turned the alarm off, he thought back to the dream he had. "Tails said I'd be him for a day.... too bad it was just a dream." he thought to himself. He looked at his bed and noticed that his costume wasn't on it. "Strange," he said aloud, "I thought I left it on my bed". Then he noticed 2 things, first, his mouth felt different from how it should as it moved, and second, his voice sounded different. Feeling more awake, Josh pulled off the covers and nearly jumped out of bed in surprise: under the covers, instead of seeing the rest of his body clad in blue PJs, he saw Tails's body, sneakers and twin tails. He held up his hands and saw that they had white gloves over them and his arms, like the rest of his body were covered in orange fur. Slowly, Josh got out of bed and looked at his reflection in the window. Tails stared back at him. Hesitantly, he reached out and touched one of his tails, he could feel his hand on it. That shocked him and at the same time thrilled him. Finally he pinched his cheek and noticing that the pain felt real, and everything around him felt solid instead of ethereal like a dream setting would be, he concluded "This is really happening". Suddenly Josh was wide awake, twin tails swishing with excitement, he ran out of his room and over to the guest bedroom. As he ran into the room he exclaimed, "Ethan wake up! You'll never believe this!" The figure in the bed lifted his head up and said, "What are you yelling about Josh?" However Josh noticed that it wasn't Ethan in the bed, it was Sonic. "Huh? Sonic?" Josh asked. 'Sonic' replied, "Why are you calling me Sonic, I'm Ethan." It was clear that he wasn't awake yet. Josh replied, "Can you do this for me then?" and stroked the back of his head with his hand. Ethan sat up and put a hand on the back of his head, he jolted awake when he felt quills instead of hair. "What, huh?" He said suddenly. Then he saw who had spoken to him and said, "Tails?" Josh replied, "I guess the same thing happened to you. We've become our costumes!" Ethan looked shocked so Josh added, "Don't worry, Tails told me in a dream that its only for one day." Ethan replied, "Funny, I dreamed about Sonic saying the same thing." The two of them went down stairs and fixed breakfast. Ethan was still feeling apprehensive about becoming Sonic, so Josh reminded him that it was Halloween so no one would care. After getting their school bags ready they waited for the bus. Twenty minutes passed and it didn't come. Ethan said, "I hate it when the bus makes us late." Josh replied "Yeah... but who says we need it?" Ethan replied, "You think we can make it on time if we run or something?" Josh gave him a look that said "How could you forget something so obvious". Ethan looked down at himself and then said, "Just because we look like this doesn't mean we can..." but was cut off when Josh spun his tails and hovered in front of him. "Oh... maybe we can." He said. After a moment his expression brightened and he added, "I've always wondered what it's like to be fast. I'll see you at school. I'm going for a run!" He zoomed off. Josh spun his tails and flew over the city. Flying felt amazing, just as he thought it would. It had been a year since Sir Sonic, knight of the wind, had brought peace to Camelot. Sonic had long since returned to his home dimension, but he was anything but forgotten. He'd been such a great inspiration to the knights of the round table that they constantly trained to better themselves. The kingdom had been peaceful under the leadership of queen Morgan, who'd been in hiding during the dark times. Her son Mordred volunteered himself to be the new royal wizard. Sir Percival had just finished a sparring match with Sir Lancealot when she noticed the hilt of her sword had been dented during the duel. She sent for the royal black smith only to find out that he was ill. Privately she wondered if he was faking illness because he felt he was irreplaceable, since he did give off an air of smugness sometimes. Putting her suspicions aside, Percival decided to go to the town blacksmith instead. She walked into the town blacksmith's shop and naturally he was surprised by a visit from a well known knight. However he quickly recovered, introduced himself as "Miles", and cheerfully fixed her sword. A month later Sir Percival decided that she could do better if she had lighter armor, since she didn't have great physical strength like Sir Gawain. She decided to give the job to Miles, figuring that she could always have the royal smith redo it later if the armor wasn't good enough. Plus, there was something she liked about Miles's cheerfulness. When she returned to the shop a week later to pick up the armor, she saw that her money hadn't been wasted. Her new armor was much higher quality then she'd expected, and lighter than her old suit too. After she'd beat Sir Lancealot by surprising him with the agility her new armor offered, she went into town to thank Miles by offering him dinner at the royal court. It was the start of a wonderful romance. Sir Percival had thought to herself in the past that she should marry someone of stature however Sir Sonic's unorthodox nature had taught her to loosen up sometimes when it came to tradition. When pressured about her love interest, she retorted that "Without good smiths, our kingdom would have long ago perished at the hands of its enemies. Therefore he is of a most noble profession!" Eventually they were married at castle Camelot and half a year later Sir Percival gave birth their first child: a male fox with fur like his father's, but he had his mother's eye color [Author's note: I'm going to assume that mobians, even camelot ones, don't give birth to hybrids under normal circumstances]. They wondered what to name him, then Miles came up with the name "Blade", "since blades are what brought us together and represent our passions." he explained. "I need a vessel for my plans so I took your son. Soon you will all bow down before me or die." The royal knights quickly assembled and with Morgan's help, tracked Mordred to an abandoned prison. Miles had insisted that he come with them. They fought their way through hordes of underworld creatures and eventually reached Mordred. Upon seeing them burst into his chamber, the evil wizard declared, "Your too late: The dragon revival ritual has already begun!" The group noticed Blade chained to an altar, his was muzzle streaked with tears and he was clutching his favorite blanket like a lifeline. Mordred moved between Blade and the knights, "I can't have you interfere." He declared. A fierce fight ensued. Mordred was but one man, but he used underworld summoning spells to even the odds. Eventually Percival locked swords with Mordred just long enough for Miles to sneak up and bash Mordred's head with his trusty war hammer. Mordred crumpled and his summoned knights vanished. The group turned their attention to Blade. Dark energy was flowing from the altar into his body and his fur had already turned black. Miles freed him from the chains and Percival grabbed him from the altar. However the dark energy was still surging into him and his eyes were started to turn red. "How do we stop the ritual?" Miles said desperately. Suddenly Nimu, the Lady of the Lake appeared from a magic circle. "There is one spell that can save him, but it requires blood given but not taken." "Use my blood!" Miles and Percival said in unison. Percival and Miles cut themselves with Percival's sacred sword and the lady of the lake began the spell. The darkness within Blade tried to fight back but golden light shown from Miles, Percival, and Nimu. 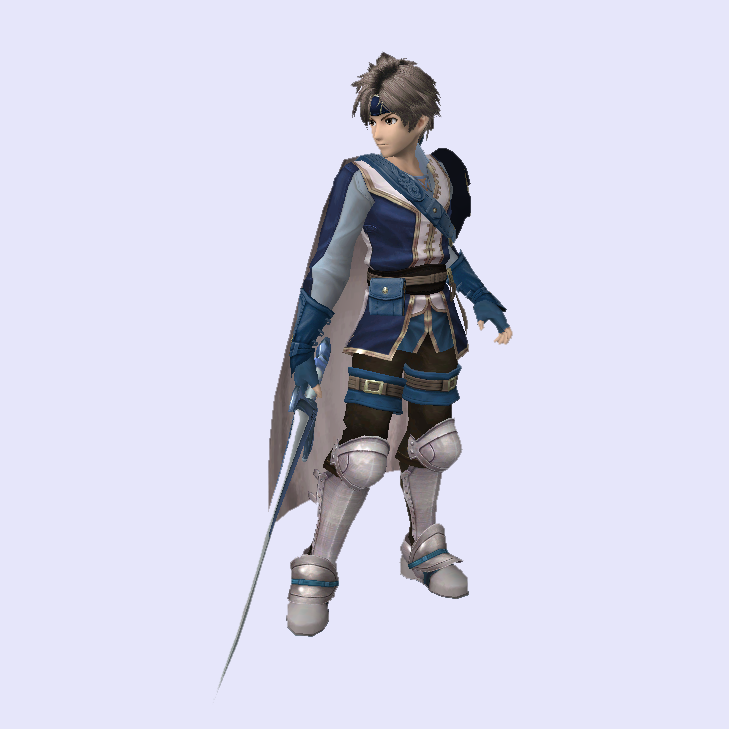 The light enveloped Blade causing his eyes to return to normal and his ears turned white. Sacred symbols appeared on his hands. After a few moments, the light and darkness stopped. Miles and Percival fell to their knees since the spell had drained them, with the latter still holding Blade. He looked up at them as if waking from a nightmare. "It's alright now." Percival said and started trying to purr, since that always calmed Blade down. However suddenly Sir Gwain tackled them out of the way of a burst of dark energy. In her weakened state Percival lost her grip on Blade. Mordred was down, but not out. He started chanting another spell, and a dark vortex appeared behind the knights. All of them struggled not to lose their footing as the surrounding air was sucked into it. Sir Lancealot had the split second realization that Mordred was too weak to both maintain his spell and protect himself from another attack so he teleported behind Mordred and ran him through. Nobody moved for a couple seconds and then Miles asked, "Where's Blade?" Percival looked around and upon realizing what happened, she screamed. Nimu informed them that Mordred's final spell was meant to "send away one's enemies". In another time and another place, a baby's cry split the night air. 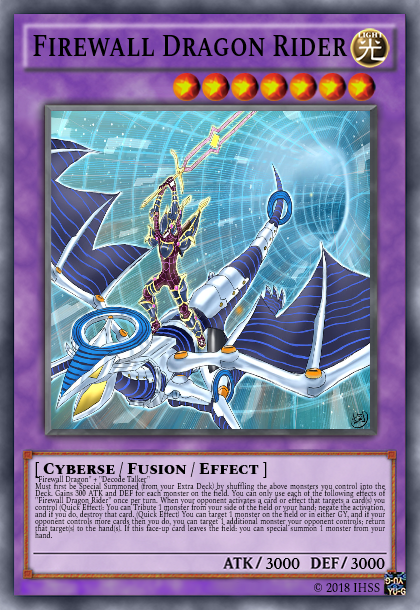 I don't have much faith in my ability to make created card decks right now so I'm trying to make a cyberse deck. 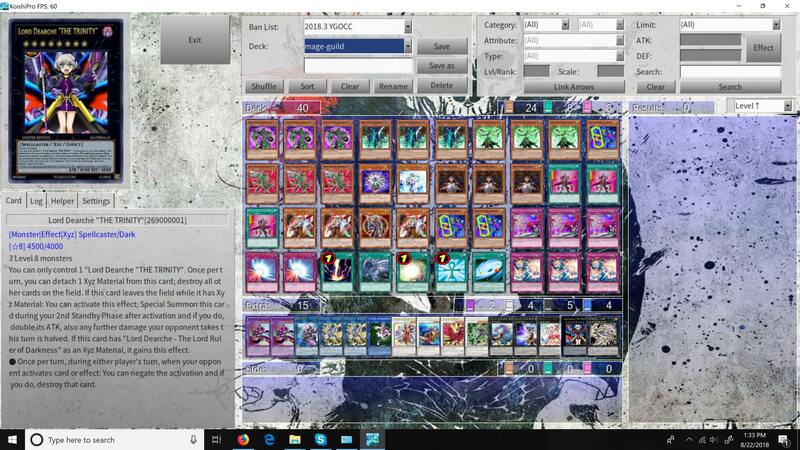 The format is TCG banned list with OCG cards added on and the cardpool is TCG/OCG, though Cynet Mining isn't available yet. As for the goal of the deck, I just want it to be able to keep up with other decks better then what I usually duel with. I've never tried to play this deck before so any advice is welcome. IDK what anti spam measures we have right now, but clearly they aren't working. How should we fix this? edit: Meant to say "Spambot"
Don't forget http://yugioh.wikia....reme_King_Z-ARC, which might break it but I've been out of the game for so long that I very well could be wrong. Zarc is pretty good if you manage to summon him though. LINK–? - 2500 / ? Cannot be Special Summoned from the Extra Deck, except by its own effect. You can banish 1 other Link monster in your Extra Deck and send cards from hand, Deck or field to the GY, equal to the Link Rating of the banished monster; Special Summon this card from the Extra Deck (this is treated as a Link Summon). When Summoned this way: Declare the directions of this card's Link Arrows, up to the Link Arrow amount of the banished Link monster, and if you do, this card's name becomes that monster's, and replace this effect with that monster's original effect. Now, I like the idea; the plan was executed poorly. This card is extremely overpowered, considering how it can literally Summon itself as any 2500 ATK Link–4 monster you choose, by using monster from your hand, field, and Deck as the Link Materials to Summon this card from the Extra Deck. You also get to pick out where the Link Arrows point to. Now, remember, this all for the cost of banishing the original Link monster from your Extra Deck. This card is absolutely broken. LINK–? - 1000 / ? Cannot be Special Summoned from the Extra Deck, except by its own effect. Once per turn: You can banish 1 other Link monster you control or in your Extra Deck and send cards from your field to the GY, equal to the Link Rating of the banished monster; Special Summon this card from the Extra Deck (this is treated as a Link Summon). When Summoned this way: Declare the directions of this card's Link Arrows, up to the Link Arrow amount of the banished Link monster, and if you do, this card's name becomes that monster's, and replace this effect with that monster's original effect. I'll allow you to be the judge as to whether you will take my advice for the card or not, but if you take advantage of the this card's ability to Special Summon itself as another monster and change the directions of the Link Arrows, it will allow for some effective combos regarding effects that interact with Link Arrows. It looks like Solgaleo from Pokemon Sun (judging from the mane, the little extension around the mane, and the slight difference in musculature between Disaster Leo and Solgaleo) with wings added on and sphere underneath it, but maybe you were using it as a guide so I'll give you benefit of a doubt there. It is missing the tile texture around the glowing magenta sphere. And is it is missing the little mannequins in the bottom that are holding the sphere up as seen on the card art along with the crown underneath the lion statue. Perhaps you were just starting, and you realized you couldn't do something to add it into the SSBB mod? On a positive note, the color scheme is somewhat reminiscent, but that is about it. I mean it is a start to say the least, but it definitely does look unfinished. My previous renders that I've shared were also texture edits or simple additions. edit: I updated my threads here to credit the orginal sources of the models. #7127059 Anime Songs that made you feel like you were part of the viewing experience. This plays for the first time during my favorite scene in all of yugioh. That pretty much sums it up. Yuma: "Bring it on III!" 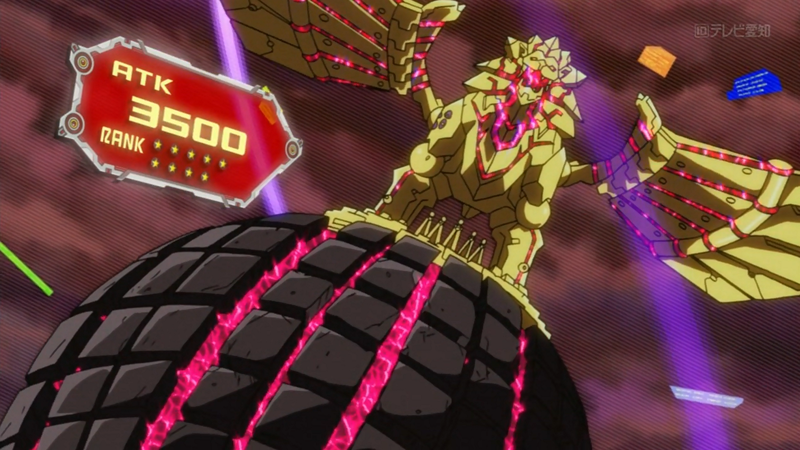 III: "My power isn't just Machumac"
III "I release calbera's catapult to advance summon the OOParts monster, sol monolith. When sol monolith is advance summoned I can change another monster's level to 6. Mud Golem shakoki level's up!" III: "I overlay my level 6 Mud Golem and sol monolith. Using these 2 monsters I construct the overley network"
III: "Behold, this is the new power I recieved from Tron!" Yuma: "Go Hope Ray, start by attacking Heart Earth Chaos Dragon!" Number 96: "Too naive! Activate Trap, Chaos Alliance. This changes the ATK off all my Chaos Numbers to the monster on my field with the highest ATK. Now all my monsters have 2500 ATK." Yuma: "Hope Sword Asura Divider!" Yuma: "Continue by attacking Chaos of Arms!" Yuma: "Now all I have to do is destroy Black Storm, then its over"
Yuma: "Hope Ray attack Black Storm! At this moment I activate slepnir mail's effect. My monster's ATK becomes the same as yours." Number 96: "How foolish, you've lost the Number on your side of the field, thus when the turn ends due to the effect of Number Karma you'll take 500 damage. You've made a grave miscalculation"
Yuma: "My turn's not over yet"
Yuma and Astral (speaking together): "Slepnir mail's effect activates, when the equipped monster is destroyed I special summon Hope, King of Wishes from my Graveyard"
Yuma: "Come forth, Hope, King of Wishes!" Number 96: "For me, a GOD, to lose?" Yuma: "I told you before, he'll always give us hope and guide us to victory. Hope sword ragna kaiser slash!" I was going to use this in a ssbb mod but it didn't work out. None the less I thought someone might appreciate it. Even if you can only remember a tiny bit of the dream, do tell. There was this one dream where literally dreamed I was Miles "Tails" Prower. I remember running down the street where I lived at the time spinning my tails behind me. I could literally feel them like they were a part of my body. Another time I dreamed that I was myself, except for the fact that I had fox ears and a tail, and access to star trek technology such as a tricorder. Another time I dreamed that I was an OC I'd created who had wings. I was able to fly using them. I have flying dreams relatively often, even if sometimes the rest of the dream is realistic, but usually its superman style flying. I could also feel my wings like they were a part of my body. I once dreamed I was a green lantern. That was fun. I also once had a dream where I could rewind time for everything else except for myself. Also, a dream that wasn't as fun as the above, but still interesting. I dreamed that I was an OC who my dreaming mind invented called "Black the Hedgehog". I had the ability to run faster then normal since I was keeping pace with a car. Also I could plow through obstacles such as a chain link fence while running. If I recall correctly I could also turn invisible. To wrap this up: I had a dream that was a Jackie Chan adventures episode (I wasn't a participant in this dream): someone, I forget who, used a forbidden chi spell to give the J team the powers of cartoon characters such as Looney tunes. Visually these look good. Love the art since it looks very fitting. My main concern is that you can deal (2500 x 3) + (3000 x 3) 16,500 damage with an open field using an easy to summon rank 4 ("Dragobeast Deity Arc-sword dragon", the "base form") as the only prerequisite. Counter Cat makes this even more of an issue since with it you can make it either (4000 x 3) + (3000 x 3) or (2500 x 3) + (5500 x 3) using counter cat on one of the arc sword dragons. I'd highly recommend making the extra attacks only target monsters. 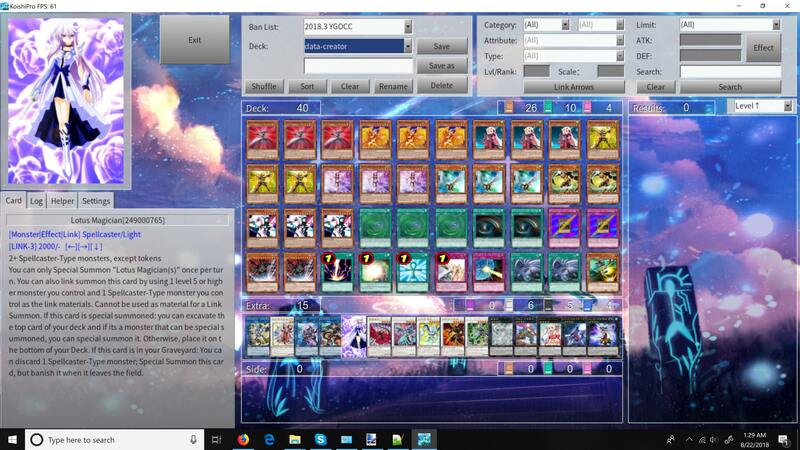 Look at http://yugioh.wikia....tech_Overdragon as an example of how this is done, though that's based on number of fusion materials but its close enough. Shrine is presumably missing a "you can" in the quick effect, which is confusing. IDK if this is newer OCG but it sounds like a mandatory effect somehow. If you do make the changes to the extra attack effect, I'd might want to try these out with your permission and credit to you. 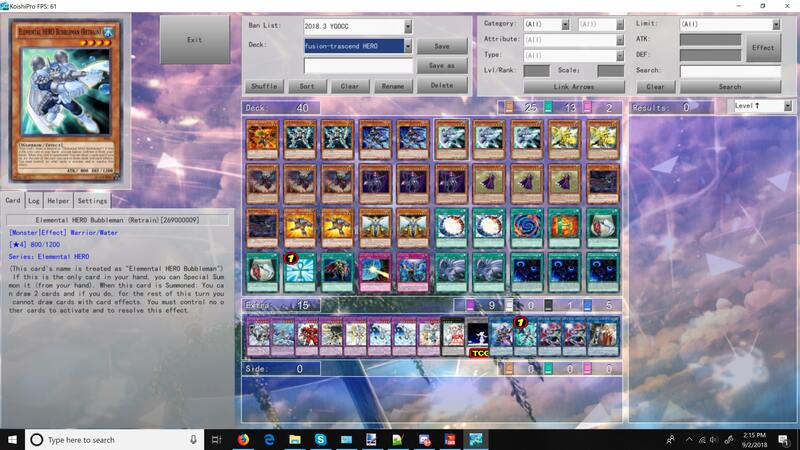 "Firewall Dragon" + "Decode Talker"
Must first be Special Summoned (from your Extra Deck) by shuffling the above monsters you control into the Deck. Gains 300 ATK and DEF for each monster on the field. You can only use each of the following effects of "Firewall Dragon Rider" once per turn. When your opponent activates a card or effect that targets a card(s) you control (Quick Effect): You can Tribute 1 monster from your side of the field or your hand; negate the activation, and if you do, destroy that card. (Quick Effect) You can target 1 monster on the field or in either GY, and if your opponent controls more cards then you do, you can target 1 additional monster your opponent controls; return that target(s) to the hand(s). If this face-up card leaves the field: you can special summon 1 monster from your hand. The Strategy is to setup and use Data-Creator to get the cards you need in order to win. 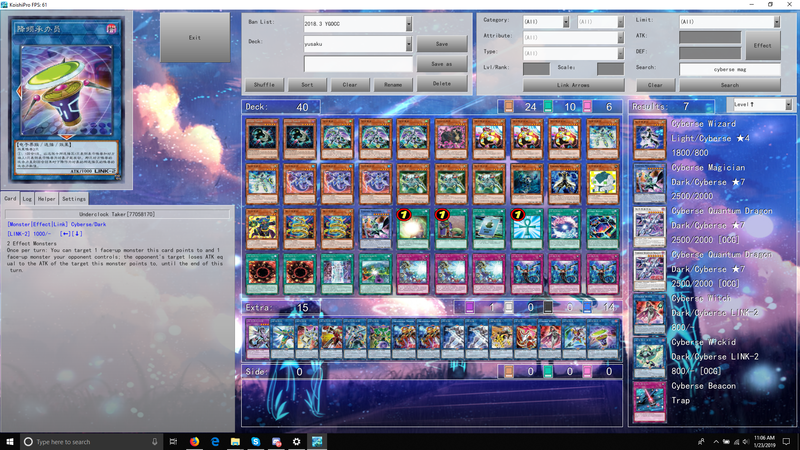 We're looking for people to hang out and enjoy dueling with custom cards in YGO pro. We have our own server for dueling with the cards. YGO pro coding skills are optional.